Prepare for the Outdoors, including your own backyard! Do not wear perfumes or fragrant clothes. Use unscented laundry detergent to keep your clothes neutral. Wait to shower. Don’t use hairspray, or shimmery make-up. Wear light colored long sleeved shirts, long pants, socks and enclosed shoes (no sandals or open-toed shoes!). Tuck your shirt into your pants and your pants into your socks. Don’t worry about how you look. I’d rather look like an idiot hiking where no one can see me anyway than have to deal with how I look when I’m suffering in pain from Lyme disease. Spray your pants, shoes, socks, and gloves with Tick repellant such as Permethrin or those containing at least 10% DEET (NOTE: Adults can use 12%-25% DEET. Parents should read info for use on children more than 2 months old). When working in the yard, wear light colored gloves. Wear a hat when working near trees and bushes. 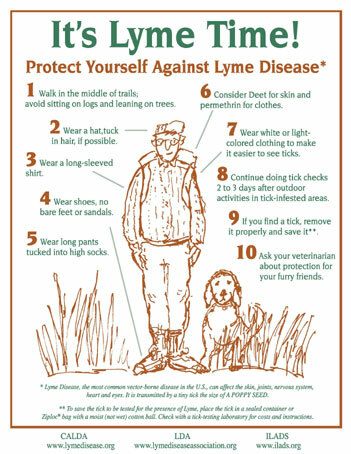 Avoid tick infested areas, do not sit directly on grass, rock walls, or logs. Walk in the center of trails when hiking. Keep in mind ticks like to hang on the end of blades of grass, bushes, or limbs. They are waiting for you to brush up against them, so be aware of your surroundings. Heat and freezing temperatures will NOT kill ticks or Lyme Borrelia! If possible, have someone else check you. Make it a family tradition and teach your children how to do so. Use a flashlight for ticks that are too small to see with the naked eye. They will shimmer similar to Mica or glitter (that’s why you shouldn’t wear shimmery make-up!). Dry your clothes on high heat for at least 1 hour immediately. Do not even lay them on the floor to prevent ticks from getting into your house. I like to shake them off outside, too. Ticks don’t come out in the wash! Continue to check for ticks for 2-3 days after outdoor activities. Treat them with tick prevention medicines such as Frontline or Advantix. Vaccines are still available for pets as well. Talk to your veterinarian for more details on pet prevention options. Wash and/or brush them thoroughly before bringing them inside. Check them thoroughly for ticks, too. If they don’t NEED to go outside, don’t let them outside. Even if ticks don’t bite them, they can carry them indoors. It only takes one tick. See the Pets page for more information. Be sure to remove it properly! See the How to Remove Ticks page for more details. SAVE THE TICK! And send it for testing to determine if it was a carrier of the Lyme spirochete or any of the possible co-infections. DO NOT WAIT for symptoms or a rash to occur!!!!!!!!!! If you were bitten by a tick, you need to go to your doctor for further assessment. It is possible to contract Lyme disease without ever seeing a tick or presenting a rash. Don’t take any chances if you know you were bit. Eat a healthy diet, get plenty of sleep, and reduce stress. The majority of your immune system is in your gut, so this is the number one mode of prevention. In the event of infection, you want your immune system and health to be at its best. This increases your chances of success exponentially. See the Therapeutic Support and Nutrition pages for more details. Used with Permission: Lyme Disease Association, Inc.